The Festival of Indra Jatra held in September each year and heralds the end of the monsoon season. It is primarily in honor of the rain god, Indra. According to ancient legend, the young Jatra disguised as a farmer, descended to earth in search of Parijat, a white flower his mother, Dagini, needed to perform a ritual. He found the Parijat, but was caught by the owner of the meadow where he found the flowers. He was bound and imprisoned in Kathmandu until his mother, worried about his extended absence, came looking for him. When the city folk realized who they had imprisoned, they were appalled, and immediately released their divine prisoner. Out of appreciation for their prompt release of her son, Dagini promises enough dew throughout the winter to ensure a rich crop One of the main events of the Festival of Indra Jatra is the Kumari Jatra, or Kumari Festival (also called the Rath Jatra, or Chariot Festival), which occurs on the third and fourth days of the Indra Jatra. One of the primary events of the Kumari Jatra is the pulling of the three-tiered chariot bearing the Royal Kumari's ornate palanquin through Kathmandu. During the three days of the festival that the Royal Kumari is carried through the streets of Kathmandu, she is attended by two other living gods, Ganesh and Bhairav. These two boys are selected in much the same way as the Royal Kumari, but as they are of lesser importance do not live in their own palaces, but with their parents and have few ceremonial duties save the Indra Jatra festival. Ganesh is the son of Durga, or Parvati, and the son of Shiva. He has the head of an elephant because, after he was created from dust by Durga, he blocked the way when his father came back. Shiva, flying into a rage that he could not enter his home, cut off the boy’s head. At the insistence of Parvati, he brought him back to life but, being unable to find the head, he gave him instead the head of a white elephant. Bhairav, or Kumar, is a manifestation of Shiva himself. Day 01: - Arrive in Nepal international airport transfer to Hotel. 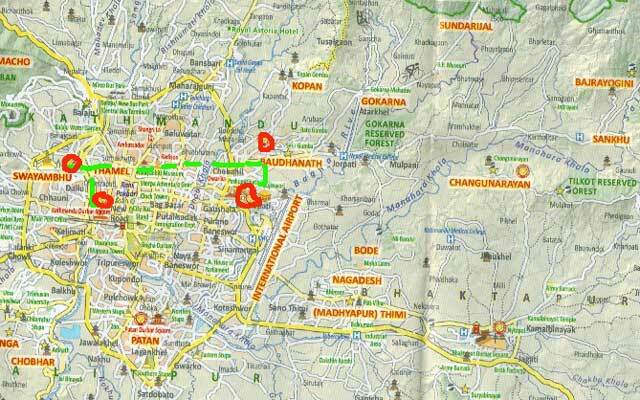 Day 02: - Sightseeing in Kathmandu such as Monkey temple, Boudhanath stupa and Kathmandu Durbar square. Day 03: - Day 05: - Celebrate festival Indra Jatra festival. Day 06: - Drop to airport for own way journey or next trip. Day 03: Day 05: - Celebrate festival Indra Jatra festival.